TORONTO, Feb. 5, 2019 /PRNewswire/ -- Gratomic Inc. ("Gratomic" or the "Company") (TSX-V: GRAT) (CB81–FRANKFURT) a vertically integrated graphite to graphenes, advanced materials development company announces the submission of two additional Exclusive Prospecting License ("EPL") applications along the strike from its Aukam Graphite mine in Namibia. Gratomic's CO-CEO Arno Brand stated, "Through applying for additional ground, Gratomic will be able to explore the extent of the shear zone along the strike. Having followed the shear zone hosting the graphite to the end of available outcrop, our expectation is that it continues along strike below the aeolian sand cover." 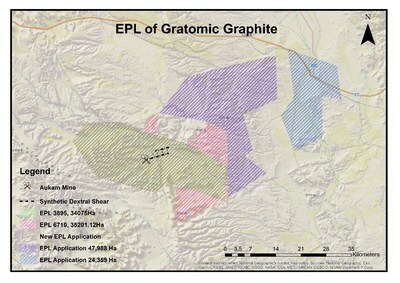 The following map displays the Synthetic Dextral Shear and the Graphite Occurrence at the Aukam Mine (this image is displayed on www.Gratomic.ca). The technical content of this News Release was reviewed and approved by Steven Gray, P. Geo., a "Qualified Person" as defined by National Instrument 43-101 - Standards of Disclosure for Mineral Projects.